If you’re reading this post in an RSS feed you may want to take two seconds to click through and view the brand new incarnation of ErinCooks.com. After a year and a half of bright blue and green and some frankly absurd looking potholders I finally coerced CK into sitting down and helping me work out a new design. You’d think that living with a web developer would be an asset when you have a blog, but here’s the rub, no one wants to code for their girlfriend when they have to code for their job all day. I just couldn’t resist the whimsical tea party background I ended up selecting, and of course there had to be a few hints of pink here and there. We even gave a subtle nod to ErinCooks 1.0 by using the often maligned font Curlz MT again as an accent. But what really made this whole redesign seamless (and frankly almost effortless) was our decision to utilize the amazing Thesis WordPress theme. The customization ability and ease of use of this product is phenomenal. I’d highly advise you to invest in a copy if you’re in the market for a great new look for your own blog. So what do you think? Have I finally jumped the girlie girl shark? Or is the new layout just Erin being Erin? I’d love to hear your feedback in the comments and please do not hesitate to let me know if you find that something seems to be amiss or working improperly. Hi Jess – Thanks for the feedback! Unfortunately that’s really the only way I can utilize the BlogHer leaderboard ad in the design and I’m not a blogger who “does it all for the love of blogging.” I like to get a little compensation for my work and the leaderboard ad = a larger BlogHer pay check. I know it sounds awful and perhaps a bit mercenary, but it’s the truth. Love it!!! Yes, it’s a wee bit girly, but what’s wrong with that? Let your girly girl flag fly! I love the little html hints in the comment section, too, btw! the condensed story/post feeds at the bottom of the front page are good. very big-time online newspapery. or something like that. At any rate I love having MORE of you in one place. small critique/thought? your pictures are too inviting not to post as much as you can… any chance of doing little thumbnails next to your “other post feeds” ?? I’m just a lazy person, and tend to lean towards pictures more than words (you know I’m an admitted skimmer!) I could be wrong, and it might be TOO much to have pics down there, too… but like I said… your pics (and your fabulously witty writing, of course!) are what really draws me in. I like the shop button! and how cute is the twitter button? Carrie – I like how you think dear, however, I believe asking CK to figure out the code to add thumbnails to the teaser posts would kill him this week. But I will definitely keep it in mind. I don’t think what we have now is final by any stretch of the imagination. This Thesis theme is killer. There’s just so much possibility. I just love it! Very cute! I love it. My sister is a web designer…so I know the feeling of having that resource seemingly at your fingertips and not getting the changes done. We must be on the same wavelength though because I just spent all weekend working on my new design with her. Hi, Erin. Nope, that doesn’t sound awful at all! Given all of your hard work creating such polished, engaging material and keeping this place looking and feeling so professional, you are certainly entitled to a little compensation (beyond our undying admiration, that is). Congratulations again on the new design. It looks great! I would love to know how you did that flickr version too, very cool! I LOVE it!! The backdrop is adorably retro!! It’s so refreshing to start with a new design. Your new blog is so totally cute. 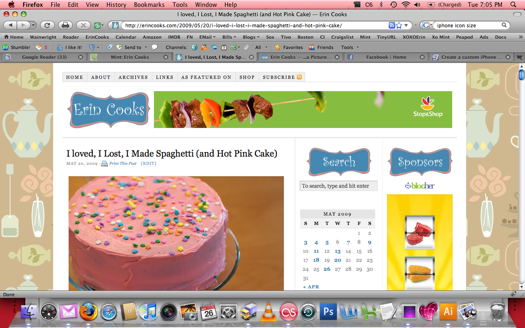 If I had a food blog, this is what it would look like. Well done EC! I love Thesis! It’s what I use on the cape blog. So easy to work with! Erin – Thanks Erin! I think your resolution may be a tad too small. Here’s a link to a screenshot so you can check out how EC 3.0 should be appearing in your browser: Click Here. I love it, Erin! The design is really pretty, and nicely funky. I love the new look and I love your place here. It is one one my favorite blogs to visit! I love your new look! the background is so pretty! I’ve always wanted a background like this. Very cute! I love your tea party theme and the new graphics for each section label!